He was the “favourite son”, the “King” of the Courgain quarter, and his popularity there knew no bounds. Léon Vincent was born in the Rue Royale on 21 July 1875, the son of a customs clearance agent. He later took over the business and expanded it (opening branches in Boulogne and Dieppe). An ambitious man, he could not resist the lure of a political career. By the age of 25 (in 1900), he was one of the youngest town councillors in France and then, in 1919, became (radical-socialist) deputy mayor. 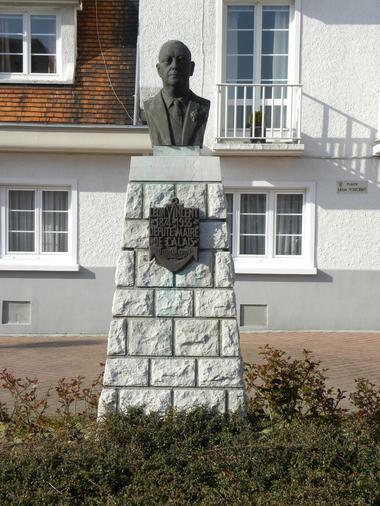 He served as mayor from 1925 to 1933 (being re-elected in 1929) and as Member of Parliament between 1928 and 1936. 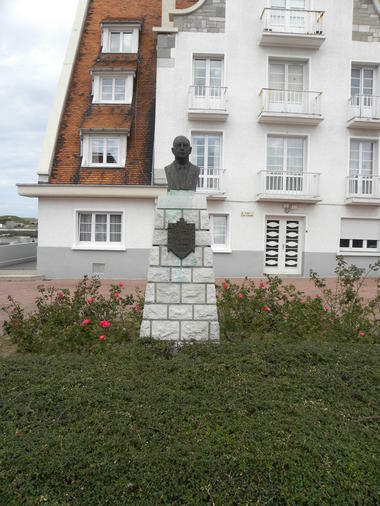 After the war, he again served as a town councillor, this time under Gaston Berthe. In addition, he was also secretary of the Chamber of Commerce and Industry for 50 years, was made an Officer of the Légion d’Honneur, and served as president of a large number of associations. He was a skilful politician who was close to the people, a handsome, elegant man with an eye for the ladies and an extremely generous man (awarding medals, rewards, etc.). And he was something of a character; he once went into a travelling circus’ big cat enclosure and smoked a cigarette there while the tamer performed his act. The bust: The bust was sculpted by L. G. Buisseret (from Mons in Belgium) in 1951, before Léon Vincent’s death. The bust originally belonged to a private individual. A fundraising campaign was launched to set it on a plinth. 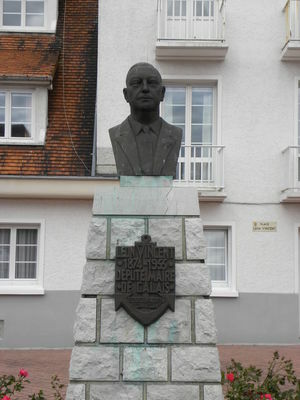 The new monument was unveiled on 24 June 1962. There is no review about Le Buste De Léon Vincent, be the first to leave one !